Federal 357 Magnum Ammo 158 Grain Hydra-Shok Jacketed Hollow Point ammo for sale online at cheap discount prices with free shipping available on bulk 357 Magnum ammunition only at our online store TargetSportsUSA.com. Target Sports USA carries the entire line of Federal Premium ammunition for sale online with free shipping on bulk ammo including this Federal 357 Magnum Ammo 158 Grain Hydra-Shok Jacketed Hollow Point. Federal 357 Magnum Ammo 158 Grain Hydra-Shok Jacketed Hollow Point ammo review offers the following information; For nearly a century Federal Ammunition has put its focus on manufacturing quality products with cutting edge technology. This dedication to excellence has given Federal a competitive edge as an ammunition technology giant. Today the company is well known for producing high grade centerfire, rimfire, and shotshell ammunition that shooters everywhere know and trust. Federal Personal Defense ammo is designed to keep you ready in case you find yourself in a self defense situation. Its high quality components allow for precision accuracy and tighter follow up shots. This dependability is what makes this 357 Magnum round the ammo of choice for many law enforcement agencies. Federal Premium 357 Magnum is the perfect choice to defend your home or as a concealed carry option. This Federal Premium 357 Magnum ammunition is loaded with a 158 grain Hydra-Shok Jacketed Hollow Point bullet. Hydra-Shok is the first choice for many military and law enforcement officials across the globe. The unique center-post design of the Hydra-Shok Hollow Point delivers controlled expansion while the notched jacket provides efficient energy transfer for maximum penetration. The deep penetration of this jacketed bullet satisfies even the FBI's stringent testing requirements. These Federal personal defense loads feature increased muzzle velocity and energy compared to standard loads. This Federal Premium 357 Magnum ammunition is perfect for self defense situations. Federal Premium 357 Magnum is non-corrosive, new production ammunition in boxer primer and reloadable brass cases. 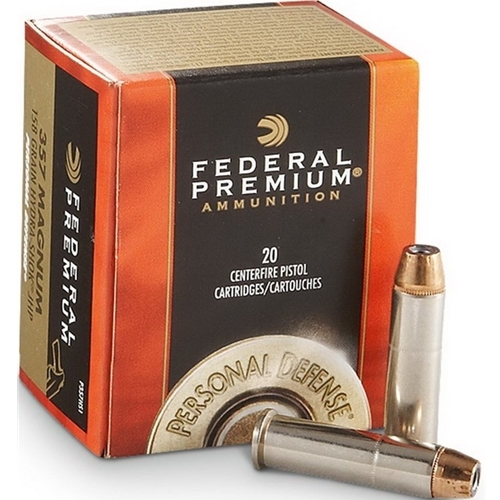 Federal 357 Magnum ammo is packaged in boxes of 20 rounds or cases of 200 rounds. Purchase a case of Federal Premium 357 Magnum bulk ammo from Target Sports USA and receive free shipping! Hydra-Shok is the first choice for many military and law enforcement officials across the globe. The deep penetration of this jacketed bullet satisfies even the FBI's stringent testing requirements. These personal defense loads feature increased muzzle velocity and energy compared to standard loads. Was very shocked that the first 3 rounds tore through the same single hole on my target. Let a range buddy try the next 3. Same result! Damn good revolver ammo!! !